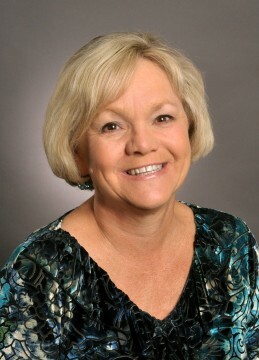 Sarasota County staff is putting a focus on “engaging young people” — starting with those in middle school — to let them know about the potential for their future employment in county departments and to ensure the county’s workforce is diversified, the county’s human resources chief has told the County Commission. “We’re real focused on that,” Joanie Whitley said of that initiative as she made a presentation to the board during its March 30 budget workshop. One facet of a county diversity hiring effort “we’re really very proud of,” Whitley told the board, is the number of women in upper management. 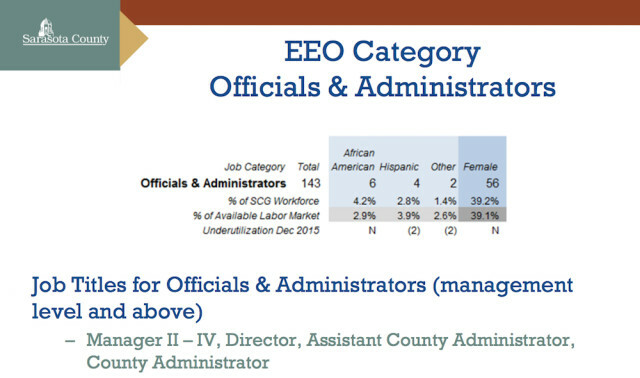 Equal Employment Opportunity data she and her staff reviewed showed that females comprised 39.1 percent of the Sarasota County labor market available for such positions, and 39.2 percent of the county’s department directors, managers and assistant county administrators was female — 56 out of 143 — as of December 2015. However, she pointed out, the county has done “a really good job” of recruiting women firefighters. Nationally, from 2008 through 2012, Whitley explained, females comprised 3.8 percent of the 295,600 total, while in Sarasota County, the current figure is 4.9 percent. However, only 3.6 percent of the county’s firefighters are African Americans, compared to 7.2 percent nationally from 2008 to 2012; firefighters of Hispanic origin make up 5.1 percent of county firefighting employees, compared to 9.4 percent in the national data. Statistics show African Americans make up 4.1 percent of the county’s available labor force for firefighters, while people of Hispanic origin represent 8.5 percent of the available county workforce for Fire Department employment. That is another reason county employees are making the effort to let local young people know about employment opportunities with the county, Collins pointed out. His staff members also are utilizing the National Testing Network to increase diversity in the Fire Department, he said, and they are reviewing recruiting measures firefighting units are using across the United States to broaden the applicant pool. Overall, county employment is “actually pretty reflective of the community,” Whitley said, except for women. For example, she continued, on Dec. 31, 2015, 5.2 percent of the county workforce was African American, at a time when 4.1 percent of the available labor market was African American. That 2015 number was up from 4.7 percent exactly a year earlier, a chart showed. Those of Hispanic origin made up 5.4 percent of the county workforce at the end of 2015, compared to 5.2 percent at the end of 2014. However, people of Hispanic origin make up 8.5 percent of the available labor market. On the other hand, according to the statistics Whitley provided the commission, 48 percent of the workforce was composed of women, but only 30.1 percent of total county workers as of Dec. 31, 2015 were women, down slightly from 30.6 percent on Dec. 31, 2014. Nonetheless, a separate chart showed that 41.3 percent of all applicants for county jobs in 2015 were women, up from 39.8 percent in 2014. Further, 31 percent of new hires in 2015 were women, up from 28.9 percent in 2014. Regarding African Americans: They accounted for 8.8 percent of new hires in 2015, up from 4 percent a year earlier. Those of Hispanic origin also represented 8.8 percent of new county employees in 2015, down slightly from 9.6 percent in 2014. County Administrator Tom Harmer has reported that the county has about 2000 employees. 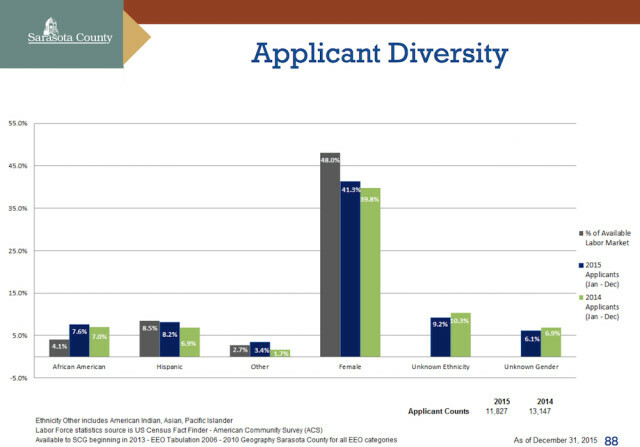 County staff also advertises job openings on diversity-focused websites, she noted, and it has begun in-house diversity training. “That’s really created an inclusive workplace,” she said. All managers must undergo diversity training, she added, and such a focus is part of every new employee’s job orientation on the person’s first day of work. “We’re really trying to look through all of our practices and procedures through a diversity lens,” Whitley told the board.